Do you dread holiday fireworks, the unexpected ringing of the doorbell, the annual trip to the vet? More importantly, does your dog? Canine anxiety causes stress on the whole family, but Relaxin' Rover can rescue even the most skittish of scooters. With two billion CFUs per sachet, Relaxin' Rover is formulated with a proprietary blend of natural calming ingredients and probiotics that help promote digestion, immune function and a healthy metabolism. Our Salmon Sushi flavor blend may help inflammation and assist in stress. 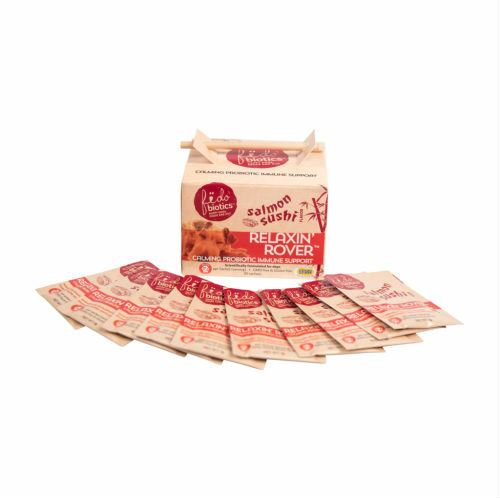 Relaxin' Rover also contains such goodness like kale, barley grass and flax seed, as well as soothing ingredients such as L-tryptophan, chamomile flower and ginger root. With fish and shrimp flavoring, Fido can enjoy his own version of a salmon sushi roll. The sachet can be given daily or on occasions of anxiety or stress and immune support. Always GMO and gluten free, Relaxin' Rover may be just what your Fido needs to go from a nervous nelly to a chillaxin’ max! One box has 30 sachets. Ingredients List: A Proprietary blend of (Valerian root, Chamomile flower, Ginger root, Turmeric extract, L-trytophan, Lactobacillus acidophilus, Chlorophyllin, Bifidobacterium lactis, L. bulgaricus, Streptococcus thermophilus, L. plantarum. Barley grass, Beef Liver, Chia seed, Fish flavor, Fish oil, Flax seed, Kale, Shrimp flavor.